Go to hotelballymun.com to book a room in the hotel. We've been invited to put on a day of music in this historic building shortly bfore it's demolished. This will also be the debut Irish performance of Matjaz Galicic, the noise musician from Slovenia. 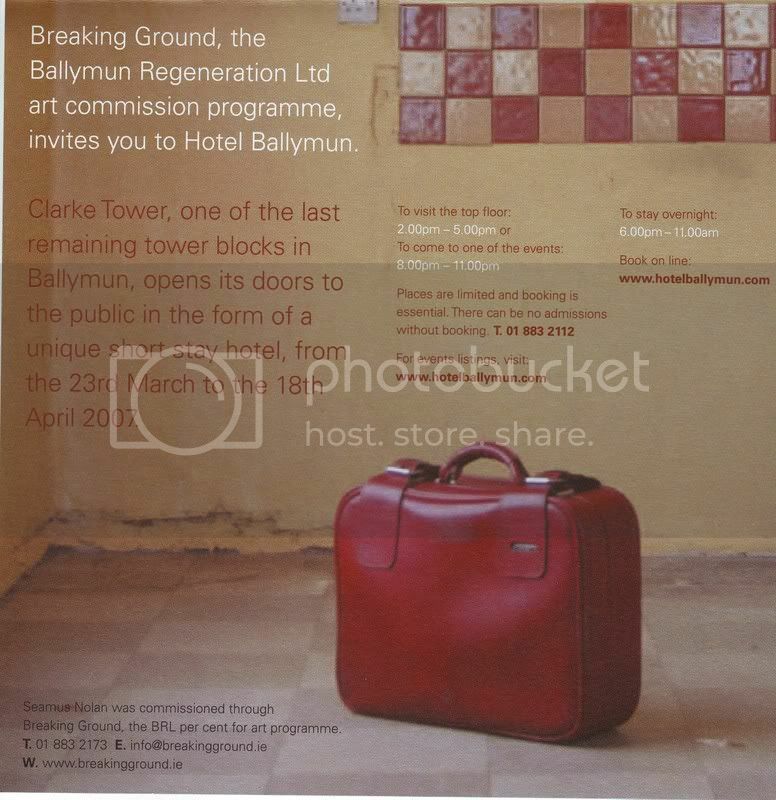 From 23rd of March to the 8th of April 2007 the top floor of the Clarke Tower, one of the last remaining tower blocks in Ballymun, will open its doors to the public in the form of a unique short stay hotel. Artist Seamus Nolan was commissioned by Breaking Ground, the Ballymun Regeneration per cent for art scheme, to undertake a new work in this changing suburb of Dublin. Nolan, who developed and researched his project locally for the past twelve months, has enlisted the help and support of Ballymun's vibrant network of community groups and is working collaboratively towards the conversion of the former flats into short-stay hotel rooms. Hotel Ballymun will also feature an eclectic programme of art, music, seminars and social events,curated by the artist. Hotel Ballymun re-considers the utopian architecture of 1960’s Ballymun and encourages the practice of salvaging and re-imagining objects, spaces and resources from the past, which can be re-used inventively to meet contemporary needs. The result, though minimalist and economic in its aesthetic, will be resonant with character and unexpected interventions - in contrast to many of today’s new apartment blocks and hotels.